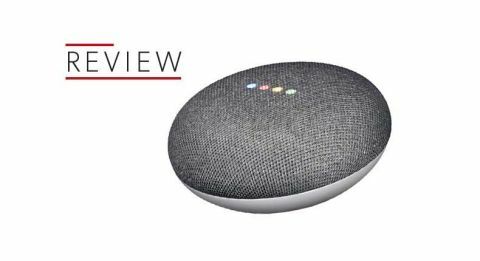 Google Home Mini review | What Hi-Fi? The Google Home Mini is, basically, Google's spin on an Amazon Echo Dot. It's a dinky device that comes with Google Assistant and can be used purely as a wireless speaker or as a smart hub, through which you can control other Google Home or Chromecast-enabled speakers around your house. At £49, it's a whole 99 pence cheaper than the Amazon equivalent. If the robot takeover is going to take place, it may well start with voice assistants. Just as Amazon, Apple, Google and Microsoft have been busy working on improving their respective AI assistants, we have been busy filling our homes with their voice-powered hardware. There’s no need for the robots to sneak in the back door, we’ve welcomed them in with open arms. Plug-in the Google Home Mini, the company’s entry-level smart speaker, and it’s easy to see why. The set-up process proves surprisingly calming in its faultless efficiency. Power-up, download the Google Home app on your phone and tablet, then tap and talk your way through a series of privacy warnings and voice commands, accompanied by various bleeps and flashing lights. The set-up will help you connect to music services – Spotify and Google Play Music are offered here – and to nearby Chromecast devices (ours sniffs out a Sony Android TV), and then you’re just about done. Once the Google Home Mini is happy that it’s learnt your voice and enough about you, it’s ready to get started being your virtual butler. The device itself is unassuming. Its ‘360 sound’ design looks more like a small speaker than its nearest rival, the futuristic-hockey-puck-style Amazon Echo Dot. Buttons and connections are kept to a minimum, with just a mute microphone switch tucked around the back. Touch controls on the device itself allow you to adjust the volume, but you’re meant to be using your voice or at least the Google Home app, of course. Like Amazon’s Alexa devices, much of the connectivity is handled by the app – though there’s less of it in general. There’s no aux output, so you can’t connect to a better pair of speakers or your music system, and there’s also no Bluetooth output. The lack of Bluetooth is negated by the presence of Google Chromecast, which allows you to connect to and control compatible apps and services, such as Tidal, Netflix and YouTube. You can send music from your Tidal app to the Google Home Mini or play/pause Netflix on a compatible TV, for example, and can group multiple Chromecast devices for multi-room music. What else you can do is largely dependent on compatible services and devices – the former is pretty thorough, the latter relies heavily on Google’s Chromecast ecosystem. Sonos, for example, is not yet on board, though the Sonos One, which currently supports Amazon’s Alexa, is due to get Google Assistant later this year. Sony, B&O, Philips and Polk are on board with selected hardware, however. In terms of services, you can get news and sport updates from the BBC, Sky, Reuters, CNN and more, and you can control YouTube, Netflix and Spotify among others. MORE: What is Google Chromecast? Which speakers and TVs are supported? And it all works pretty well. Sonically, the Google Home Mini sounds noticeably better than the Echo Dot. Voices are full and clear, and it’s perfectly listenable when it comes to talk radio or voice answers – and this is the speaker’s primary use. If you want to play music, the better sonic balance means it’s fine but don’t expect it to go particularly loud or be anything more than an average sounding speaker. Google Assistant’s abilities will be familiar to anyone with an Android phone or tablet and are largely impressive. It’s every bit as good at hearing you as Echo devices, and for the typical sort of questions, it understands you more often than not, and also tends to have an answer. Provided you don’t veer too far from basic diary, weather and search queries, Google’s knowhow ensures you will hear a search result, even if it’s not quite sure of the answer. While it’s not quite the perfect experience, it’s hard to complain too much about what the Home Mini does. It is primarily a good voice assistant, with the ability to control other devices. More compatible devices and improvements to the AI will only improve things – just don’t expect it to be a top-notch music speaker.